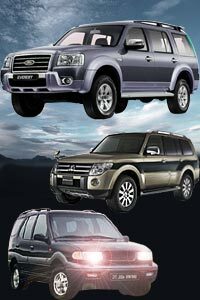 We present concise and lucid information about Indian suv in these pages. Sports Utility Vehicles (SUV) are, despite their negative gas guzzling image, most popular for their rugged looks and off-road capabilities. Basically a SUV is a rugged passenger car with the towing capability of a pickup truck. It is large, spacious and equipped with a 4 wheel drive (not mandatory). Most SUV have ladder chassis and generously rated suspensions to handle off road conditions. The under side of the engine needs to be fitted with a guard - Scuff plates, to protect the oil sump and other vulnerable parts. In short, a SUV is designed from the ground up for a comfortable travel for a large family on roads or off it. In India may people confuse Multi Utility Vehicles (MUV) with SUV. Tata Safari was the first true blooded SUV from an Indian manufacturer. Toyota Land Cruiser, Toyota Fortuner, Hyundai Terracan, Nissan X Trail, Mahendra Scorpio, Ford Endeavour, Maruti Grand Vitara, Honda CRV and Mitsubishi Pajero are the current favorites on the Indian roads. The tall stance and the imposing presence makes a SUV attractive for women drivers. In the US, women account for more than half of all users for SUV. If you want the cavernous space of the SUV but the maneuverability of a Sedan - you need a Cross Over. First off the block is - Tata Aria, closely followed by the Mahindra XUV 500. They are big, use the same engines as their SUV cousins - but offer easy maneuverability of a Sedan - loaded with all the bells and whistles. They use monocoque chassis which results in lower weight and combined with their power - can result in better torque/weight ratio. French Automobile giant - Renault has come with (Dacia) Duster - a small SUV with traditional European design - unlike their earlier boxy kind they brought in the form of Logan. Ford is getting ready to offer EcoSport - a smaller SUV soon. Sub 10 lakh Rupees SUV space is getting hotter. With the kind of road conditions in India, it is not a big surprise that SUVs continue to sell like hot cakes.